What is the object behind the loco? If you had thought we had all forgotten about our Mystery Photo Competition, you would have been very wrong! Here is the very last part. What is it? (1 point) If you reply ‘a thrush’, you are on the wrong website. Try here instead. Where is it? (1 point) Replying ‘near a railway line’ will earn you instant disqualification. Extra marks for identifying the loco (1 point), giving a brief history of the railway and the local town (max 2 points), identifying the latter’s principal industry in Victorian times (1 point) and supplying other facts (max 2 points) which Dyspozytor may find interesting or amusing. It is an old joke in the BTWT office that – if PKP Directors were stopped from travelling around Poland by plane and chauffeured car, and were forced to look up their train times, buy their own tickets and travel by scheduled train services like the rest of us – the standard of Poland’s rail services would leapfrog in a month and be totally unrecognisable in a year. In the meantime, passengers suffer appallingly bad service and are confronted with expensive new ‘improvements’ which are inferior to the facilities that they replace. The new Warszawa Centralna departures board only has space to show the departure of the next nine trains. During the rush hour, the view ahead is only 30 minutes, more or less. Not much use if it is, say, 08:40 in the morning and you are wondering whether or not there is time to dash over to The Radio Cafe for a quick breakfast before catching the pospieszny train to Katowice. In fact, not much good for getting to Katowice at all, as the fact that the 08:50 to Bielsko Biala actually stops at Katowice (the Polish equivalent of Birmingham) is judged not important enough to be displayed on the panel. Nor are any of the 13 other stations at which the 08:50 stops en route. How about Torun? Again no trains are displayed, but the 09:00 to Bydgoszcz will take you there without any trouble. Perhaps, we are picking the wrong stations? Maybe the designers of this futuristic-state-of-the-art display did not want to refer to places tainted by Poland’s communist past? How about Gdansk? The heroic defence by postal workers of the Polish Post Office there, and the birth of Solidarity are events indelibly etched into the pages of Polish history. But, oh no, Gdansk doesn’t get a mention either. We ARE told that the 09:00 Lajkonik (hands up all those readers who said to themselves, ‘that’s the 06:00 ex Krakow Glowny’) stops at Warszawa Zachodnia, Ilawa and Malbork, but again the display cannot cope with the additional information that this train stops at the three principal stations in Gdansk and also could drop us off at Sopot for good measure. How did this functionality and design calamity come about? A little judicous Googling came up with the answer! Tommorrow we will summarise what’s been happening on PKP during the month of January. Have a good weekend! The recent derailment at Stewarton has motivated the editorial team to reread some railway accidents reports. Our thinking is that if BTWT is to comment on such matters, we should, at the very least, try to be well briefed. The key reports are all on-line, but their locations are not readily apparent by Googling. Here are the links to the key reports for any readers who are interested in such matters and would like to join in our research. We intend to spend a couple of weeks ploughing through these reports and looking at any other information that may be available. Any help from readers with a background in railway Civil Engineering will be much appreciated. The Smigiel Railway’s Romanian diesel railcar is having a makeover. Well nearly all the seats! A massive oil tanker train fire, with flames shooting 50ft into the air and dark smoke obscuring the sky, greeted residents on Tuesday morning in Stewarton, Ayrshire. The accident scene, more reminiscent of railway disasters in the Ukraine or Byellorussia, occurred near a compound used by contractors who are reinstating a second track along a 5½ mile portion of the Barrhead to Kilmarnock line which was singled in the 1970s. A DB Schenker train consisting of 10 BP rail wagons carrying heating oil and diesel from the Grangemouth refinery to the Scottish Fuels terminal in Kilmarnock caught fire today at 06.25 when the rear section became separated from the rest of the train. Six of the 10 wagons were derailed and one was alight. Four remained on the rails still attached to the locomotive. There were no casualties. The site of the derailment coincides with an underbridge that was due to be demolished this weekend. It is very close to the start of a 5.5 mile ‘dynamic loop’ (one that allows two trains to pass without stopping) that is being installed between Stewarton and Lugton. The £20 million contract was awarded by Network Rail to Jarvis. Track works commenced in September 2008 with works on the stations due to start early in 2009. Work is scheduled to be completed by October 2009 for a half-hourly Kilmarnock – Glasgow service to start at the December timetable change. Was the collapse of the underbridge the cause of the derailment or merely a consequence of it? Was the underbridge weakened by any work carried out by the contractors? Is today’s fragmented railway less safe than the British Railways’ vertically integrated railway? Was the traditional experience based safety culture inherently safer than the current paper-based ‘box ticking’ safety regime which has replaced it? Comments, from BTWT readers, as always very welcome. Tornado, the first new main line steam locomotive to be built in Britain for almost 50 years, will haul her first passenger train on the Network Rail main line from York to Newcastle-upon-Tyne and return on Saturday 31st January 2009. This train, The Peppercorn Pioneer, is for the supporters of The A1 Steam Locomotive Trust who raised the funds to build the new Peppercorn class A1 steam locomotive over the past 19 years. The train is a repeat of the one hauled by the last Peppercorn class A1, 60145 Saint Mungo, on 31st December 1965 shortly before she was scrapped, and will consist of 13 carriages, equating to about 500 tons, and will run at up to 75mph. The new £3 million Peppercorn class A1 60163 Tornado will be wearing her new apple green livery with ‘British Railways’ on the tender as carried by the first 30 of the original 49 Peppercorn class A1s when built. ‘Tornado’s’ first main line passenger train is the end of another chapter in the story of a project thatmany said could never be completed. In 1990 a group was formed with a vision and the determination to make it succeed – to build and operate a Peppercorn class A1 Pacific steam locomotive for main line and preserved railway use. 18 years later, and thanks to that shared vision and determination, ‘Tornado’ turned her wheels in anger for the first time on 1st August 2008 in front of the world’s press. It is thanks to our more than 2,000 regular monthly and other donors, our sponsors led by William Cook Cast Products Limited and the hard work of our volunteers and contractors that the project has achieved so much. The Trust is now looking to the great British public to help us keep ‘Tornado’ on the main line by making a donation, sponsoring a component, taking part in our covenant scheme and/or our £500,000 bond issue. The second run of The Peppercorn Pioneer on Sunday 1st February 2009 will now start from Doncaster with 60163 Tornado, picking up at York and running through to Durham. This change of itinerary is because the Trust has been advised by Network Rail and the British Transport Police that due to significant concerns regarding crowd control at Newcastle Central station on Sunday 1st February, Tornado’s second train cannot operate through to Newcastle. The return journey will be hauled by Tornado from Durham to York with a modern diesel locomotive returning the train from York to Doncaster. It should be noted that Tornado will not be at Newcastle Central station at any point on Sunday 1st February. However, a limited number of tickets are now available to the general public on this second train, their first opportunity to travel behind Tornado on the main line. They are priced at £69.00 for Standard Class and £95.00 First Class and are available through the Trust’s booking agent Steam Dreams on 01483 209886. For details of how to help or where to travel behind Tornado telephone 01325 4 60163, visit http://www.a1steam.com or email enquiries@a1steam.com. Ty2-340 taking water at Kroscienko, just short of the Polish-Ukrainian border in May 1991. On June 3rd 1984, sitting in the 06:32 local from Zagorz to Premysl, I embarked on what was one of the most interesting railway trips in Poland a quarter of a century ago – travelling on one of the trains in passenger timetable 128, Przemysl to Zagorz, in the very far south-east of the country. In fact you couldn’t get much further south-east with a Polish visa. The timetable’s services included forty-odd kilometres of running through a corner of the (then) Soviet Ukraine. PKP passenger trains worked through the foreign territory under a “corridor” arrangement, with no additional visa requirements needed for those travelling. In those days, table 128 had relatively frequent local services at both its Polish ends but the only “corridor” passenger workings passing through the Ukraine were the Solina express, between Warsaw and Zagorz, running only on a restricted number of days throughout the year; and the daily local train each way between Przemysl and Zagorz, departing the former late in the afternoon, and the latter early in the morning. In the first half of the 1980s, the Solina was often steam-hauled south of Przemysl, but the express’s traction was something of a lottery. The local, however, was dependably steam-worked, usually by a Ty2 “Kriegslok” 2-10-0 (German type 52). My journey started off with Ty2-403 hauling three bogie coaches. 45 km and 1 hour 26 minutes later, we reached Kroscienko, the last station in Poland. The schedule allowed a wait of 35 minutes there, part of which was used to attach ten assorted freight wagons to the rear of the train, for transit through the USSR. It was a few kilometres from Kroscienko to the border where the train halted for about a quarter of an hour, to be searched for anything suspicious, and to be boarded by a small squad of Soviet frontier guards, including one with an Alsatian dog. Most of the guards posted themselves in the front compartment of the first coach, and the rear ditto of the third. One or two probably travelled on the loco’s footplate to prevent the crew picking up ‘hitchhikers’. A chap in ‘civvies’, wearing a good-quality long overcoat and no doubt the local KGB representative, embarked in the coach in which I was travelling. The frontier paraphernalia here – and likewise re-crossing the border some 40 km further on – featured the full fearsome array of watch-towers, barbed-wire fencing, broad strip of raked sand, and all the rest – and this between two supposedly allied nations. Within the sad and ludicrous context, it seemed a relaxed-enough scene. The man in the coat chatted, apparently quite amicably, with the Polish passengers; and a lot of the frontier guards looked to me about twelve years old, and not the slightest bit menacing. My general experience of ‘gricing east of the Curtain’ was that while producing a camera was – unless you were lucky – an invitation for immediate mayhem, other railway-enthusiast-type activities, such as map-consulting and note-taking, seldom upset anyone in authority. This didn’t seem to make a lot of sense – but then in those days, things making sense was not part of the deal. I decided to keep my camera well hidden, but otherwise carry on business as usual, and if challenged, to do the ‘clueless tourist’ number. It worked well: map, timetable, notebook – nobody batted an eyelid. The man in the overcoat seemed to take no notice of me whatever. There was one stop of several minutes for signals at Starzhava, the first station within the Soviet Union – otherwise the run between border-points was non-stop. All signalling observed in the USSR was colour-light, whereas everything at both Polish ends of the route was semaphore. From Starzhava onwards, the route was mixed-gauge – European 1435 mm and Russian 1524 mm – on a four-rail track. The line (once a double-track main line in the days when all this area belonged to the Austrian Empire and long since singled) ran through very pleasant mountain-foothills scenery. As on the Polish side of the border, many white storks were to be seen, always a joy of visits to Poland in the spring or early summer. The route from Zagorz to Przemysl. My excitement mounted as we approached Chyrov, the main town on the Ukrainian section of the run. For Western railfans, the Soviet Union was a frustrating mystery. Unlike with virtually all Communist nations further west in Europe, foreign visitors to the USSR were not allowed beyond the restricted tourist trails. This was maddening for railway enthusiasts, who wanted to learn about the steam situation nationwide, and to go and experience it. Nothing can be kept totally secret, however, and general picture perceived in the ‘70s and ‘80s, was that the Soviet Railways had got into modern traction early and enthusiastically, and by the mid-‘80s, though many shunting turns remained steam worked, steam locomotives had mostly been phased out on line working. So foreign gricers observed and enjoyed what limited opportunities they legitimately could, and a select few ventured – with almost insane bravery – in search of steam beyond the areas their tourist permits allowed, into places where they had, in Soviet eyes, no business to go. Sooner or later, such ploys came unstuck, and the best that the culprit could hope for was immediate expulsion from the USSR, and being declared persona non grata there for ever after. Few people had the bottle to indulge in such capers; for the more timorous majority, any chance for a look at an obscure venue in the Soviet Union without putting one’s head on the block, was to be treasured. PKP’s timetable 128 workings gave such an opportunity. Chyrov was a junction with a route running eastwards, and with a locomotive depot. In the 1980s, folk passing through on the corridor trains were able to observe the steam locomotives at depot – often actually noted in steam – though whether by this date they performed any line working, or only shunted, remained unknown. The steam type most prominently featuring here, were Kriegslok 2-10-0s (German class 52); on occasion, 0-10-0s were also noted. On the morning of my journey, the scene proved a bit disappointing. There could be seen in Chyrov station, a Soviet diesel loco on a rake of wagons, and one Kriegslok fully in view, apparently in good condition but not in steam; and there was at least one more steam loco, unidentifiable, inside the tightly-closed shed building, adjacent to the station. Reports from other enthusiasts who made the journey at later dates than myself, mentioned Soviet locos observed in steam at Chyrov. Thus, I was just a little unlucky. Perhaps the day being a Sunday had some relevance? The border at Kroscienko runs top to bottom across the middle of the picture. Hover pointer near the box marked ‘Sat’ and click ‘Show labels’ to view. The railway line runs just to the North of the road. The track running parallel to the border, some 1 1/4 miles to the East marked the start of the Soviet-era security zone. The map can be zoomed and scrolled. This piece originally appeared, in a slightly different version, under “Travellers’ Tales” here. BTWT would like to thank Pawel Mieroslawski for providing the photograph at the head of the article. If you are not Polish, buying a steam engine in Poland can be a tricky business. How do you confirm whether the fellow trying to sell you the locomotive is legally entitled to sell it? How do you find out whether or not the locomotive is listed as a heritage monument and cannot be repaired or moved without the consent of the Wojewodzski Conserwator Zabytkow? Who has got the boiler book and repair schedule? How much does the fellow want for the documentation? Can you trust your agent / interpreter / intermediary? Are they adding on their own 200% margin to the proceedings and also expecting a back hander from you? Suppose you have now bought your steam engine? Where do you put it? How much will you have to pay to rent the space? What about covered accommodation? How much would it cost to repair? Can you trust your fitter to do a professional job? Well if you would like to rescue a Polish steam engine, keep it in Poland and restore it either cosmetically or into full working order, now may just be the right time. Fundacja Era Parowozow is trying to put together a plan to rescue some of the steam locomotives that PKP deems to be surplus to its requirements. PKP’s last go at reducing its park of redundant steam locomotives caused such an enormous stink that the FEP team reckon they have a good chance to persuade PKP bosses to let private groups look after some of Poland’s 200 or so ‘surplus’ steam locomotives. Two arrangements are envisaged: (i) outright purchase at scrap metal value; (ii) a licence arrangement transferring custody of the locomotive, subject to a legally binding condition that the locomotive remains in Poland and certain restoration conditions being met. FEP are looking for expressions of interest from organisations or individuals with the means to make it happen. The Fundacja management team are genuine railway enthusiasts and are not looking to rip anybody off. Further details from either Miroslaw Szymanski, the Chairman of FEP, or Robert Dylewski his assistant. Oh, and by the way, if you do get your proposal accepted by the Foundation and start getting round to looking for somewhere to keep your locomotive, do drop BTWT a line. You never know, we may just be able to help! The picture shows Ty2-559 and was taken on Thursday 15 January 2009 in the Dzierżno works of Przedsiębiorstwo Transportu Kolejowego Holding Spółka Akcyjna a private freight operator. The cosmetic restoration included a completely new cab, new coal bunker, boiler cladding and smoke deflectors. Ty2-559 was stored for a long time at Chojnice. The locos new custodians are the AGH mining and foundry university in Kraków, outside whose headquarters the locomotive will be plinthed. An SOS from Pyskowice informs us that a typically Polish game of ‘pass the parcel’ threatens the future of the railway museum there. Since 1998, a small band of volunteers, working under the umbrella of Towarzystwo Ochrony Zabytkow Kolejowych (Society for the Preservation of Railway Heritage), has been collecting vintage railway rolling stock and other railway artefacts, and storing them in the old Pyskowice motive power depot and carriage works. Until the end of 2006 TOZK enjoyed the use of the old depot and sidings at a peppercorn rent from PKP Linie Kolejowe, the PKP Group’s track and infrastructure company. It was always the hope of TOZK that the Pyskowice Town Council would acquire the site from PKP in lieu of unpaid rent and that the council would licence the society to use the depot. But Pyskowice is not a town which encourages ‘bottom up initiatives’. The Mayor is not interested in helping the Society. In the meantime, the site has been transferred from PKP Linie Kolejowe, to PKP’s real estate company PKP Nieruchomości, and the latter are demanding that the Society pay a commercial rent for the site backdated to the beginning of 2008. The only hope for Pyskowice would appear to be with the Slask province governor’s office which in recent weeks has begun to take an interest in the future of the museum. It’s been some time since we requested BTWT readers to engage in a letter writing campaign, but our friends in the British-Polish Railway and Industrial Heritage Partnership advise us that the situation at Pyskowice is serious enough to merit such action. It is still the case that letters from ‘the West’ carry more clout than correspondence from a Polish address, so lets do our best to help TOZK in their efforts to save the museum. This time we would ask you to write to the three key stakeholders involved in the future of the Pyskowice museum. Letters should stress the heritage and tourist value of the former MPD complex and its collection of historic rolling stock. You may wish to make the point that ‘bottom up’ initiatives such as TOZK work in Pyskowice deserve support because, without them, much of Poland’s railway heritage will be destroyed. Please tailor each letter depending on who you are writing to. Andrzej Wach is the Chairman of the PKP Group as a whole. Letters to him should point out that the Pyskowice Museum and Society is looking after an important part of PKP’s history and ask him to encourage PKP Nieruchomości to return to the earlier peppercorn rent arrangement with TOZK. Waclaw Keska is Mayor of Pyskowice. Letters to him should point out that the collection at Pyskowice is of European significance and that news of the threat to the museum has spread far and wide. They could also express the hope that he will give the railway museum venture his wholehearted support. Piotr Smigielski is the Governor of Slask province. Letters to him should point out that the collection at Pyskowice is of European significance that deadlock between PKP and TOZK threatens to destroy the museum. They could also express the hope that his office will take over the railway museum site and provide it at a peppercorn rent to the society. This letter was left today in the comment box of our 20 July 2008 article Swanage Railway Project has new boss. We assume that Keith Jackman has sent us a copy of a letter that he sent to incoming Swanage Railway Trust Chairman, Mike Whitham, as he concludes with the sentiment, I wish you every success in your endeavour to get the line between Swanage and Wareham reopened. We only wish that the long arm of the Dyspozytor could stretch that far! It’s time that the Swanage Railway achieved the public transport objectives of its founders. Thank you very much Keith for sharing your memories with us. I wonder if this may be of interest to you. As lad of 14, my first job was as a cleaner on the Swanage M7 tank engine that run the push and pull service to Wareham. After 6 months, I transferred to Bournemouth Loco Depot and eventually to Nine Elms Depot, which is now Covent Garden market. At Nine Elms I rose through the links, to the mainline top link. All my work then was express passenger trains. My engine on the mainline was a Merchant Navy class No. 35017 Belgian Line. They were fine engines and, at that time, had 280 lbs/sq in pressure that would have retained a head of steam even if shovelled with cow pats. As a passed fireman on occasion, I drove the Atlantic Coast express, the Bournemouth Belle and the Devon Belle. I have nothing but fond memories of my time on the footplate, I could see which way things were heading and as driving electrics never appealed to me I decided to leave the job and become a London taxi driver. This past Christmas I was back home in Swanage and seeing the trains run on that historic line made the hairs on the back of my neck stand on end. I wish you every success in your endeavour to get the line between Swanage and Wareham reopened and look forward to once again riding that route in the future, hopefully the near future. Dear Keith, Do you have any pictures from your days when you worked on BR? If so BTWT would be honoured to publish them. A massive 25 hour translation job caused a severe disruption BTWT postings, but left me considerably wiser. An enormous amount of Polish life is still organised by the state. With local and national government present in so many ways, it is no small wonder that railway societies – genuine examples of bottom up initiatives in Polish civil society – find the going so rough. The job involved translating a calendar of tourist recreational activities. I was surprised to discover that nearly all the listed events were funded or organised by local authorities in the form of urząd miasta (town administration office), urząd gminy (municipal administration office) or starostwo powiatowe (municipal administration office). Ocassionaly I was bowled a googly in the form of miejski urząd gminy (municipal administration town office). Does this municiplity have another office in the countryside for days when the weather is too nice to stay in town? Sadly railway events were few and far between, but I did note down a few which BTWT readers might like to mark up in their own diaries. The Wolsztyn Steam Gala and the Parade of Steam Locomotives are a well established event in the Polish heritage railway calendar. This year the British-Polish Railway and Industrial Heritage Partnership are organising a week long study tour of the railway attractions of Wielkopolska during the week preceeding the gala. SKPL and the Wolsztyn Experience will be working steam hauled goods trains on the Kalisz Railway to coincide with the tour . Write to me for further details. The Long Night takes place all over Poland. Entry to many Museums and other locations is free. Last year, Warsaw Urban Transport Company, MPK, and the Warsaw Suburban Railway, WKD, operared vintage tram services. The steam-hauled Blues Express takes enthusiasts to the Blues Festival in the picturesque village of Zakrzewo on the Piła – Chojnice line. The music starts on the departure platform at Poznan station and a second train runs from Gdynia. Amazingly the price of a ticket (19 PLN from Poznan and 22 PLN from Gdynia) is the same as for a PKP osobowy (slow) passenger train! Beautiful Helen, Pm32-2, pacific express locomotive has its own feastday in August. The event is organised by the Wolsztyn Town Administration with help from the Wolsztyn Cultural Centre and PKP Cargo. The Song Contest is being held by the Wyrzysk District Light Railway, This surviving fragment of the once extensive public and private 600 mm lines in Wielkopolska deserves to be known much better by British enthusiasts. There’s many more railway events occurring in 2009. I should really compile a comprehensive calendar, One of these days… ! An e-mail from Robert Hall reminded me of the end of steam on the Waterloo-Weymouth services in 1967 and brought memories flooding back. A quick search on You Tube came up with Conncork’s Waterloo Steam Sunset 1965-67 a slide show of photographs of steam locomotives taken at Waterloo and Nine Elms depot. Some of the pictures look so familiar… I guess I must have been taking mine only a few feet away from the photographer. British and Irish Steam Memories 1950s 1960s, took me back still further: Bishops Bridge, ‘black’ green GWR Castles, the ‘back doors’ to Willsden and Southall sheds, Marylebone and the end of the Great Central main line. Here’s part of his own commentary. My first memories of the steam locomotive were at stations like Dagenham Heathway, Barking and Southend. Also between Dagenham Heathway and Bow looking from the window of District line trains on trips visiting family at Whitechapel. I can remember steam while visiting the seaside at Southend. In 1960 my family moved to Chadwell Heath and thus I came in contact with the trains from the Liverpool street lines. This was only for a short time as by 1962 this region had done away with steam. The last steam locomotive I saw on this section was at Romford station an N7 on a parcels train. My family are from Ireland so for quit a few times we had our holidays at Granmothers house in Cork. This was an wonderful experience for a train mad boy. Paddington station to Fishguard Harbour and then the boat the Innisfallen to Cork. In Cork I saw steam running on the bridge at Albert quay and through the streets, also in County Kerry I remember seeing steam trains. They started on wet Saturday in 1963 with a twin-rover for the bus and tube. With this in my hand travelling up to London and its termimus stations. Steam was seen on this cold rainy day (I can remember it so well) at Euston, Marylebone, Paddington, Victoria, Waterloo and London Bridge. With a school friend I visited Watford junction and we visited the loco shed. I had 4 happy years of train spotting visiting sheds at Nine elms, Southall, Basingstoke,Wilesden. Eastleigh and Watford junction. Waterloo, Marlebone and Paddington stations were regular haunts. Basingstoke was visited in the summer 1965. In 1966 I travelled on two Rail tours the Dorset Belle and the New Forester. If like me you knew some of these places at first hand take care not to be overwhelmed by waves of nostalgia! It is encouraging to see that conncork is still photographing steam, and posting the results for all to see on You Tube, although as yet he has not posted anything from Poland. Inside the giant human “No”. Photo Inel blog. After Tuesday’s Cabinet discussion, which failed to give Gordon Brown full backing for the third runway Heathrow runway, the Prime Minister scurried away to Germany to announce that he would be going ahead with the expansion of Heathrow. Today, Transport Secretary, Geoff Hoon, formally announced the decision to the House of Commons saying that MP’s would not be allowed to vote on the decision. With Tory leader, David Cameron, and London Mayor, Boris Johnson, both against the expansion – as well as some million plus affected residents and 24 local authorities – the plan is unlikely to survive the general election. All that protesters have to do is to delay the “point of no return” until after the election has been held. The personal narrative style of writing is a challenge to do well. Witness my From Poznan to London train journey where we have not yet left Poland. Some writers don’t have this problem, Michael Dembinski author of the W-wa Jeziorki blog is a master of the genre. The journey to W-wa Powisle (nearest station to my office) took 39 minutes. Ten minutes of that was waiting to clear the points outside W-wa Zachodnia, where trains from the south, south-west, west and north-west all converge on the city. Still, what’s that to traffic jams? 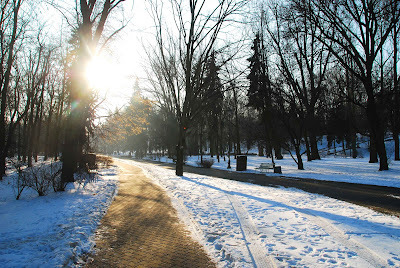 And the lovely walk at the other end, through the Rydz-Smigly park (above) to the office, takes another 15 minutes. Around an hour. No stress, no worries, environmentally friendly. As long as the train is on time. Click here to read the complete article. Both photos in this extract are by Michael Dembinski. Three short paragraphs and Michael has already questioned the priorities of the local authority in not providing him with a pavement, criticised PKP for not running their trains on time and highlighted the beauty of Warsaw in winter. Me? In three short paragraphs I would still be in the bathroom attempting to shave. Let’s see if I can emulate Dembinski’s pithy writing style. Here goes. 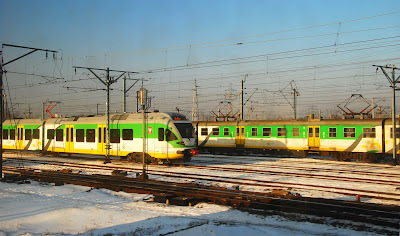 Yesterday’s Warsaw train was one of those PESA trains that have taken over most of the Lodz – Warsaw turns. After running up to a maximum speed of 139 km/h for the first few months, they’ve been throttled down to 129 km/h. Officially it is because the rulebook says you need a second man in the cab above 130 km/h. Privately it is, I suspect, because the trains bumped about so badly on the poorly aligned welded joints on the newly laid track. The track was relaid and the trackbed rebuilt at enormous cost supposedly to accommodate 160 km/h (100 mph) running. What a joke! For the first time ever I had to navigate Warsaw’s public transport with a large heavy luggage trolley. Warszawa Centralna is atrocious. One of the escalators not working, the other only working in the down direction. You get to the passage over the railway tracks, then its steps down to the long connecting tunnel, more steps down to the passage underneath al. Jerozolemskie, then slippery stops up to the busiest tram stop in Warsaw. No shelter from the freezing wind. My residual affection for Warszawa Centralna evaporates as my body temperature drops. I’m going to start lobbying for a brand new station on the old Dworzec Warszawa Wiedenska site with a direct connection to the Warsaw Metro and a decent covered tram interchange. The Metro itself is a revelation. I did not realise that there are working lifts at every station. I and my shopping trolley have no problems at all. For a brief moment I want to rush out and award the Metro boss BTWT’s Golden Oilcan Award. However, my enthusiasm is tempered by the knowledge that the Metro board have not been very helpful about providing cycle parking at their stations and that the provision of access for disabled passengers was probably a condition of the EU grant which was used to complete the one and only line. My next day’s journey brings the realisation that the Metro’s integration with other transport modes is generally poor. At Polytechnika I needed to change to a bus running on the Trasa Lazienkowska urban motorway (shown as al. Armii Ludowej) on Google maps) I had to walk as far as Marzalkowska, dodge some tram tracks, cross a busy street and take my trolley down some trecherous stairs before I reached the bus stop. Haven’t the Poles heard of integrated transport. In the evening I caught the 18:20 Pesa train out of Warsaw. Enough people for 10 carriages and only a four car PESA unit running. I stand all the way to Skierniewice. Where the rest of the train? I asked the guard. It broke down, he answers. So why didn’t you get a locomotive and some coaches? I did ask the Dyspozytor for a loco and 8 coaches, replies the guard, looking shiftily around for a means of escape. Please bring me a copy of the complaints book, I demand. Our old ones have been taken away by Przewozy Regionalne and InterCity have not yet issued our new ones yet. Memo to self: write complaint letter to chairman of PKP InterCity. Tomorrow, how to complain in Poland. I never could master the art of writing briefly. This section could be difficult to book. The story so far. Dyspozytor is planning a journey from Poznan to London by train. He has set himself a budget of 100 euro for the journey and is trying to book the journey on-line. Last week he tested the PKP InterCity on-line booking system and found it wanting. This week he looks for professional advice. That’s all very well. I hear you say. But you are making it difficult for yourself. Why not just ring up PKP InterCity and book a place on the ‘Jan Kiepura’ to Colgne and then go to the Eurostar website and book the second part of your journey from Cologne to London? Are you being serious? to borrow one of John McEnroe’s favourite phrases. For a start, the PKP InterCity website does not exactly exactly encourage customer contact. Have you seen the “Where to buy a ticket” page? That’s right it’s blank! The Polish version is little better, giving just a list of IC ticket offices and ticket agents on pdf download files, without any telephone numbers. (Since these were published InterCity has dumped most of their agents. )Last week, a good friend of BTWT went to the InterCity booking office in Warsaw and attempted to book through to Cologne and was told that their computer link to Germany was down and that they could only book him as far as the Polish border. The other reason why I’m not trying to book by phone or in person is that I want to explore as many possibilities as possible to get the best deal going, without exhausting the patience of a human ticket clerk. So it’s off to get some expert advice. First port of call is Jeffrey Dobek and his Polrail booking service. If you don’t have a spare day to surf the Internet then Polrail could be just the ticket. Dobek has been running Polrail since 1995 on a pro bono basis providing information for the rail traveller and promoting rail travel in Poland In 2006, he set up a commercial booking service specialising in rail travel within Poland and to and from selected international destinations. Jeffrey tells me his philosophy is to compete on customer service rather than price, so it might be a tad difficult to stay within my 100 euro budget. In any case PKP’s computer link to Deutchsbahn is down so he can’t quote for the journey through Germany. Oh dear! We’ve been here before. Seat 61 here we come! In 2008, Wolsztyn Experience launched its own website. Aimed at potential clients of Wolsztyn’s footplate courses, it provides basic news of developments (with a very positive spin!) an e-shop for several Polish railway books, a gallery of photographs taken by Trevor Jones (Howard Jones’s brother) and details of special trains and special events. For enthusiasts who don’t read Polish, the best thing about the website is that it is in English! Another useful English language resource is the Yahoo Group based discussion group kolejelist. A number of kolejelist members read various Polish railway enthusiast discussion boards and then translate and post the most significant of these. Finally there is BTWT. What can we say? We probably spread ourselves to thinly to be able to report on every boiler washout at Wolsztyn, but then we do try to keep our finger firmly on the pulse of the long term plans of PKP Cargo, Fundacja Era Parowozow, the Wielkopolska Province Governor’s office, the Undersecretary of State for Rail, the Minister of Infrastructure, the Engine Driver’s Trade Union… et al. Oh nearly forgot. Sometime in March the second steam working from Wolsztyn to Poznan will be pushed back from 11:36 to around 13:00hrs or thereabouts. Perhaps somebody should tell The Wolsztyn Experience webmaster? Wolsztyn-Poznan steam to run all 2009! Line clear for steam trains throughout 2009? Wojciech Lis runs the excellent Parowozy z Wolsztyna website, from which the above picture is taken. Yesterday, he published a link to a Poznan Radio Mercury interview during which Stanislaw Taciak, Manager of the Railway Transport Section of the Transport Department in the Wielkopolska’s Govenor’s Office, announced that funds had been found to support the Wolsztyn-Poznan steam service all the year round. BTWT immediately contacted its man at Wolsztyn Experience who exclaimed, That’s the first that I’ve heard of it! Our source then consulted Howard Jones and provided us with this on-the-record quote from Howard. If that’s the case then it’s good news. But we also have to be realists as far as the economics are concerned. What killed us last year, was not the 6 week break in July and August that we always have, but the 3 month June-July-August break that we were suddenly confronted with without any warning. Wolsztyn Experience had clients booked in June that had booked footplate courses and we had to invest heavily in paying for special trains and light engine movements in order to meet our obligations. After so much doom and gloom in 2008 about the continuation of Wolsztyn’s steam trains, BTWT is delighted to be publishing some good news at last. It does seem to us a pity though that whoever is making these decisions in the Governor’s office does not see fit to include The Wolsztyn Experience in the loop. Brown to push through 3rd runway? Two UK national newspapers reported on Friday that the government go-ahead for a third runway at Heathrow is imminent. Pro-runway groups, including: The British Airports Authority, British Airways, British Midland Airways, the Confederation of British Industry and the Trades Union Congress, are holding a special meeting on Monday to publicise the case for building the third runway. Gordon Brown and Geoff Hoon have agreed to present the decision for the Cabinet’s approval on Tuesday and a decision may be announced later that day or on Wednesday. The bad news, for the hundreds of thousands of people who will be affected, will be sweetened by so-called ‘binding assurances’ that strict limits on emissions and aircraft noise will be met. Also there will be an announcement that Heathrow will be linked to Britain’s High Speed railway network if the government decides to go ahead with the latter. But if a decision is announced next week, the battle will not stop then. Local authorities and anti-runway community groups will seek to challenge the government’s decision and postpone the ‘point of no-return’ until a Conservative government is elected. Prime minister, Gordon Brown, must fight a general election by 2010 at the latest and opposition leader, David Cameron, has said that he opposes the third runway proposal. BTWT’s position on the third runway is simple. Going ahead with a third runway at Heathrow is would be environmental madness. London, whose air quality is already below international standards, would be faced with an even more concentrated cocktail of polluting toxic chemicals. CO2 emissions from aeroplanes and motor traffic fumes would increase. We also believe that the Government’s case that Heathrow must have a third runway to remain a major international hub is seriously flawed. Heathrow’s role as a major international hub is already declining. If you really want to run in the Eurohub race you need at least FOUR runways, AND to be plugged into Europe’s high speed railway network. Europe’s busiest airport, Charles de Gaulle Airport near Paris has four runways, its own Ligne Grande Vitesse station and room for further expansion. Amsterdam’s Schipol Airport is planning its SEVENTH runway and has a station served by Thalys High Speed trains connecting to Antwerp, Brussels and Paris. Frankfurt Airport has excellent rail links (nearly one third of all passengers come by rail) is building its fourth runway and has room for even more. Even with a third runway, Heathrow – with its lack of fast main line rail services (Yes I do know about the rail link to Paddington! ), rat infested passageways, and widely dispersed terminals – hasn’t a hope of remaining in the top league. There is massive opposition to Heathrow, not only from the million plus residents who will face more noise and pollution, but also by the twenty odd local authorities that represent them. Mr Brown is an unelected Prime Minister, representing a party that received only 35% of the votes cast at the last election. If he tries to force the decision through, he will face a crisis similar to the one which brought down Mrs Thatcher in 1990. The story so far. Dyspozytor has decided to give himself a treat and travel from Poznan to London by train. He has set himself a budget of 100 euro for the journey and is going to try to book the journey on-line. Yesterday he tested the PKP InterCity on-line booking system and found it useless. Frustrated by his lack of progress he starts to reminisce about travelling between Poland and the UK by train in his youth. You left London around 10 in the morning on the Hook Continental from Liverpool Street to Parkestone Quay. A British Railways Steamer took you to Hook of Holland. Here your Polish couchette coach would be waiting for you. This coach would be your home for the next twenty hours or so. A change of direction at Utrecht, then the train steadily rattled Eastwards across Europe: Amersfoort and Hengelo in Holland; Rheine, Osnabruck, Hannover and Braunschweig in West Germany. West Germany was always good for a sight of its huge 2-10-0 heavy freight locomotives. The West Germans were sensible. They didn’t abandon their coal mines and heavy industries overnight the way Britain did, and they didn’t junk their best freight locomotives prematurely either. Then the fun began. First Helmstedt where in the middle of the night you said goodbye to West Germany. Out comes your passport, the border guard checks your face and photograph coincide you are rewarded by a nice stamp in your passport. Then Marienborn where the East German border guards welcomed you to their Democratic Republic. Then just as you were settling down back to sleep in a socialist state. You were being checked out of East Germany. This is it chaps. This really is goodbye to the West. With a bit of aggression this time, as if the East German border guard resented the easy way you could flip between East and West. And then the train stopped. Berlin seemed in those days to have half a dozen main line railway stations, but at this one the train stopped as if it was going to go no further. I have a vague memory that this could have been Berlin Friedrichstrasse, but if any BTWT readers know better, please write and let me know. I once asked the train guard how long we would be stopping here, and on being told 90 minutes, I went off – quite unchallenged (I only had a transit visa for East Germany) – for a wander around East Berlin. It was quite impressive, with grey concrete being the predominant theme. The reason for the wait was to allow the train to link up with the Brussels-Moscow express and plenty of recovery time had been built into the schedule. I remember one particularly hard winter when on arrival at Hook of Holland we discovered that our Polish railway carriages had not made it on time. When we finally set off we were about 5 hours late and lost time all the way. On arrival in Berlin we discovered that the Moscow express had gone on without us. The East German railway company, Deutsche Reichsbahn, dumped our carriages in a siding without providing any steam heating. Our breath froze on the windows and formed brown cigarette smoke coloured icicles which nearly reached the floor. and we were in Poland on the home stretch. That really was travel! At the journey’s end one’s passport was covered in stamps recording each stage of the adventure. Today’s youngsters don’t know how easy they have things these days. Now where was I? Ah yes, I remember now. I was going to tell you about The Man in Seat Sixty One. Well, if nothing more urgent comes up, I’ll tell you about him tomorrow. … unions threaten general strike. As PKP Cargo teeters on the edge of bankruptcy, railway trade union leaders held an emergency meeting in Warsaw today to plan their response. The unions have sent a letter to Cezary Garbarczyk, the Minister of Infrastructure, and Wojciech Balczun, the Chairman of PKP Cargo. The letter points out that the collapse of PKP Cargo would not only be a personal tragedy for each of the company’s 40,000 employees, but would also have grave effects on the rest of the PKP Group. The unions point out that they have not seen any rescue plan for Cargo. They are demanding an immediate meeting with the Minister and the board members of PKP Cargo. Fifteen union representatives have constituted a strike committee and warn the Minister that if their request is not granted they will organise protest action, which could even include a general strike. PKP Cargo has been trying to persuade the railway unions to accept 5,000 redundancies without indicating how it intends to arrest the continuing decline in its revenues. The unions have extrapolated the figures shown to them by Cargo bosses and have worked out that 10,000, not 5,000 jobs are at stake. At present, Cargo employs some 40,000 people. The above, plus the fact that Cargo are setting up some of their workshops as independent entities, would indicate that the PKP main board are trying to improve Cargo’s balance sheet prior to a sale of the company. Our betting is that the Minister will allow the rail unions to call their strike. Cargo will then be allowed to go bankrupt with the Minister blaming the unions. DB Schenker will then ‘rescue’ the company by buying up the parts that are economically sound and take on approximately one third of the present workforce. What’s the betting that Cargo will no longer be part of the PKP Group by the end of 2010?